For well over a decade, our doctors have been safely, strategically, and effectively fighting the root causes of hair loss while educating both men and women on how they can achieve natural-looking results by harnessing the power of their own cells. Through our partnership with New England Center for Hair Restoration, Regeneris Medical has developed a protocol that applies traditional hair restoration methods with the regenerative potential of cellular therapies. Our careful balance of science, art and medicine allows us to provide every patient with the best treatment, result and experience possible. Your stem cells are your body’s natural healing cells and can act as the repair system in your body by replenishing adult tissues. There are three accessible sources of autologous adult stem cells in humans: bone marrow, blood, and adipose tissue (fat). Of all stem cell types, autologous harvesting (meaning the cells are obtained from one’s own body) from adipose (fat) tissue involves the least risk. Adipose tissue can yield more than 500 times the amount of stem cells per gram of fat when compared to aspirated bone marrow. 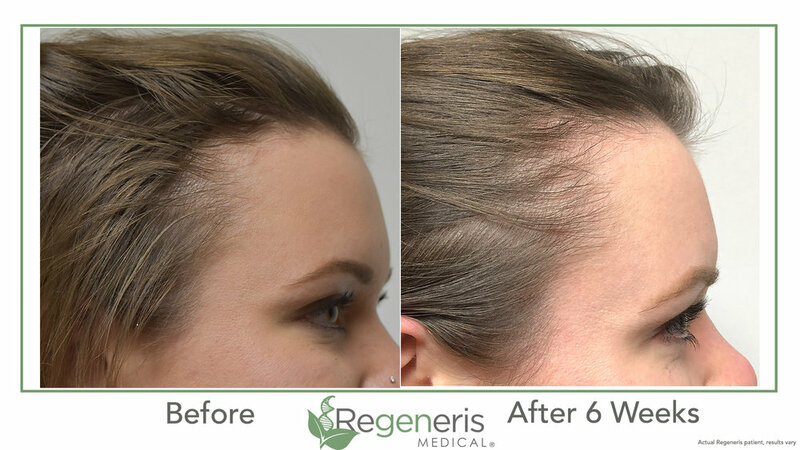 Taking advantage of this technology, Regeneris Medical has pioneered the deployment of adipose derived stem cells to treat thinning hair and hair loss. How Do Stem Cells For Hair Restoration Work? We conduct stem cell therapy for hair loss by first harvesting fat cells, concentrating the sample, and purifying it in a centrifuge system. We then combine the cells with Platelet-Rich Plasma, draw the sample out using a syringe, and inject this into the scalp to stimulate hair growth. The plasma activates already existing stem cells on the scalp. We use the finest needles to minimize discomfort. Although stem cells and PRP for hair restoration is a new field, results can be visible in as little as one month after the procedure. Due to the regenerative nature of this procedure, results can be seen over a period of three months to one year. Current medical solutions for hair loss or thinning hair include: Minoxidil (Rogaine), available in both a liquid and foam form, and Finasteride (Propecia, Proscar) which works to block DHT production. These must be used indefinitely for continued support of existing hair follicles, and neither is a cure. Low-level laser therapy is a form of light treatment used for a variety of health indications, including hair loss. Some may find success in these products, but for others they may yield no results. Anyone who suffers from hair thinning and hair loss is a good candidate for Regenerative Hair Restoration, as long as they have some live hair follicles left. This is an excellent option for people who are not ready for traditional hair transplant surgery. This procedure takes less than a day to complete and has very minimal downtime. There is no need to shave the patient’s head or move any follicles. If you are interested in this amazing technology, visit our Find A Provider section to find a Regeneris Affiliate near you! Our goal is to work hand-in-hand with you to develop a treatment plan that you feel comfortable with and confident about. We offer a wide variety of hair loss treatments designed for both male and female hair loss patients. The use of state-of-the-art technology in combination with our physicians’ surgical skills allows us to produce remarkable, natural-looking results. PRP has become a mainstay for slowing hair loss and growing new hair for both men and women, but High Density (HD) PRP has become the new standard thanks to Dr. Welter and the pioneering research of the Regeneris Medical team. Regeneris physicians have performed thousands of HD PRP procedures with outstanding results. The Regeneris HD PRP proprietary technology uses the highest concentration of platelets to ensure an effective burst of growth factors. Peaking at 18 months on average and lasting longer, the Regeneris HD PRP outperforms standard PRP which must be repeated and maintained every 3-4 months. Stromal Vascular Fraction (SVF) is a method used to extract adult stem cells from your own body. This procedure entails performing a mini-liposuction (around 50 mL of fat tissue) from the belly under local anesthesia. Mesenchymal stem cells are extracted from the tissue, which are then incubated. The result is injected directly into areas of concern. Once these stem cells are administered, they have the ability to repair and re-activate dormant follicles, forming new cells of mesenchymal origin. The entire process takes about 4-5 hours. Platelet Rich Plasma (PRP) therapy for hair loss is a treatment that involves drawing a patient’s own blood and processing it so only the enriched cells (platelet-rich plasma) remain. This plasma contains essential proteins and growth factors that stimulate natural hair growth and can deliver results similar to or better than Minoxidil or Finasteride. These cells, along with a smaller volume of blood, are injected directly into the scalp. The entire process takes about 60-90 minutes. Developed by Dr. Welter, the microFUE procedure spares donor area by transplanting follicular tissue microscopically. Adding growth factors then leaves potent stem cells in the donor area. The result is a transplanted follicle in the recipient area and the potential for the donor area to regrow. Known also as “Strip Harvesting,” FUT requires the surgeon to remove a thin, linear strip of tissue from the donor area. The tissue is then separated into units by hand and the incision in the donor area is closed, leaving a fine surgical scar that is easily covered by the hair above it. The units are then transplanted into thin or balding areas. ARTAS Robotic Hair Restoration combines state-of-the-art technology with the experience and artistry of your surgeon. ARTAS advanced algorithms are able to identify and select your prime hair for harvesting, while maintaining the appearance of your donor area – all under the control of your physician. These capabilities are available only with the ARTAS® Robotic System. + What diseases and problems can be treated? This will depend on the type of degenerative condition you have. A specialist will evaluate you and discuss your candidacy for stem cell therapy. After you have a complete understanding of the potential risks and benefits for your recommended treatment and would like to explore this avenue of treatment, you can be considered for our cellular therapies. Of course, even though it’s a minimally invasive procedure, you will still need to be medically cleared to participate in the procedure. + Is our procedure FDA approved? Regeneris surgical procedures fall under the category of physician’s practice of medicine, wherein the physician and patient are free to consider their chosen course of treatment. The FDA does have guidelines about treatment and manipulation of a patient’s own tissues. At Regeneris Medical we meet these guidelines by providing same day treatment with the patient’s own cells that undergo minimal manipulation and are inserted during the same visit. + Does Regeneris Medical use embryonic stem cells? No. Only adult mesenchymal stem cells are used. These cells are capable of forming bone, cartilage, fat, muscle, ligaments, blood vessels, and certain organs. Embryonic stem cells are associated with ethical considerations and limitations. Recent advances in stem cell science have made it possible to obtain high numbers of quality multi-potent (able to form numerous other tissues) cells from a person’s own liposuction fat. Regeneris Medical uses state-of-the-art technology to process this fat to yield approximately five hundred thousand to one million stem cells per cc of fat, and therefore, it is possible to obtain as many as 10 to 40 million cells from a single treatment. + How do you grow hair follicles from stem cells? Mesenchymal stem cells, or MSCs, are multi-potent stromal cells that can differentiate into a variety of cell types including: osteoblasts (bone cells), chondrocytes (cartilage), connective tissues and adipocytes (fat cells). Hair follicle papilla, which is a large structure at the base of the hair follicle bulb, is made up mainly of connective tissue and a capillary loop. Since it is mainly connective tissue, mesenchymal stem cells could play a role in the repair and regeneration of the hair follicle papilla. Another point to consider is that the hair follicle develops mainly from the dermis and is mesodermal in origin. Mesenchymal stem cells are also mesodermal in origin. Furthermore, there is tight ectodermal and mesodermal interaction involved in hair follicle development. We use a local anesthetic to numb the scalp and can repeat this as many times as necessary during a procedure to keep the patient comfortable. + How many times do I have to come back? Over the past 10 years, Regeneris Medical has developed a protocol that consists of one procedure and an 18-month follow-up schedule. We like to see patients at 3 months, 6 months, a year and 18 months to track progress. If you can come in person, we can take photos under identical lighting conditions at each stage and accurately chart your progress. These visits are not mandatory, but they are recommended whenever possible. + What is the expected healing time? For PRP, almost none. You may notice some redness in the treated area and any hair you have goes a long way towards hiding that. Irritation typically lasts no more than 3 to 4 days, if irritation occurs at all. Instances of forehead swelling and shedding are extremely rare. + How long until I see results? Based on the speed at which your hair grows, you can expect to start seeing a visible difference within 4-6 months. Improvement can continue up to 18 months for PRP treatments alone, and unto 5 years for PRP treatments with SVF.